The Asian Lady beetle was first introduced to Pennsylvania in the 1960’s as a natural form of pest control for aphids and scale insects. This was a mistake. By the 1990’s the Asian Lady Beetle population exploded. The insect has been steadily making its way west with no signs of slowing. In 2016 the first lady beetles in Texas were recorded. Since 2016 the Texas lady beetle population has continued to rise with no natural predators to taper them. What's the difference between a Lady Beetle & a Ladybug? In winter lady beetles like to congregate around buildings to fight the cold. If you come across a cluster of what you think are ladybugs you are most likely mistaken. There are major differences between ladybugs and their usurpers (this is the part you're not going to like): The non-native Asian Lady Beetle give off an unpleasant odor for starters, something a ladybug, on her worst day, would not do. As if that weren't enough, they emit a yellow secretion that stains surfaces. Oh, and they bite, which another thing the ladybug would never even think of. It's not a horrible bite, more like a pinch, but a bite nonetheless. 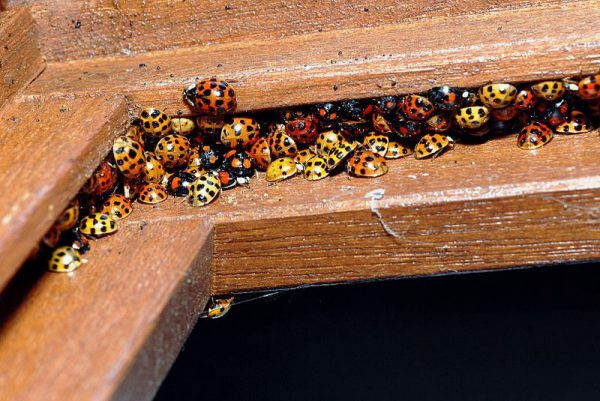 There are no easy ways to preventing Asian Lady Beetle from entering homes or controlling them once inside. Caulking and sealing outside entry points is perhaps the most effective technique. Residual Pyrethroid insecticides are often applied around areas that are not easily sealed to temporarily prevent lady beetles from entering a home. This entry was posted in Pesticide and tagged Texas Pesticide.